In response to the previous post on this theme, A Taste of Ancient Writing, we had a lovely message from Hallvard Indgjerd, a researcher based at St Andrews, who told us about his own experience of baking ancient inscription cookies. He was aiming to make a Linear B tablet and some Greek Alphabetic ostraca in gingerbread. Philip Boyes, the new Research Associate on the CREWS project, officially started work this week – and he made cookies to celebrate! Well, there was some discussion as to whether they are cookies or biscuits… but whatever you call them, they taste delicious. You can read more about them over on Philip’s blog. As you can see, they are inscribed with several different ancient writing systems – of which you may recognise some from the project logo! 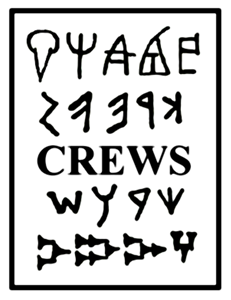 There’s also Cretan Hieroglyphic (third from the top on the right) and Cypro-Minoan (the ones at the top of the second and third columns), which were writing systems used in Bronze Age Crete and Cyprus respectively.